Starting out as a two-day start-up event in Manila during 2014, YouthHack has expanded to over several countries all over the world including Singapore, Hongkong, Italy, Dubai, Nigeria, USA among many more. YouthHack is a for-purpose organization which helps high school and university students to learn more about start-ups, technology and entrepreneurship. Learn more about the YH community here: www.youthhack.net. In the Philippines, YouthHack CALABARZON is the first official chapter that aims to reach out to provinces. 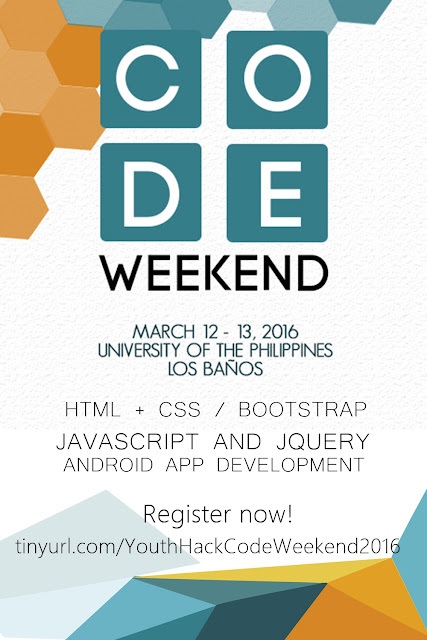 The first event is the Code Weekend, a two-day programming hackathon from 12-13 March, 2016 at the CEC Conference Room in the University of Los Baños, Laguna. This program is open to both high school and university students. It aims to help kickstart their coding journey and have them build their own project by the end of the event. You may register individually or as a team through: www.tinyurl.com/YouthHackCodeWeekend2016. For sponsorship and other inquiries, contact Patricia Evite at [email protected] (+63 975 132 7401) or message us on our Facebook page: www.facebook.com/YouthHackCLBZ.